One study showed that more than 25% Americans have recently experienced some sort of physical pain for more than a day. Pain is a sensation produced by the nervous system, may be sharp or dim, that come and go or be constant, located in a specific place or overall body, etc.. Although pain often disappears when the cause is removed, can take weeks, months, or even years. To relieve pain, many people take OTC drugs like aspirin or prescription, naproxen, ibuprofen, etc.. Other drugs stronger and in higher doses, normally only available by prescription. Some people try non-drug methods such as physical therapy and occupational, CBT, personal care techniques, and complementary and alternative therapies, such as spinal manipulation or acupuncture. From the perspective of Chinese medicine, the pain is caused by the imbalance of two types of energy. One is channel blocking power. The energy or qi (pronounced chee) You need to flow smoothly to maintain normal functioning of the body and mind, wherever there is blockage of the energy channels, there will be pain. In other words, when the energy is stuck in a certain area of ​​the body, cause pain. The factors involved in the cause of the blockage of the energy channels (also called meridians) include physical trauma, emotional stress, excessive environmental pathogenic power, well as heat, cold, and moisture. It also contributes to the problem, insect bites and excessive alcohol consumption. This type of pain is usually sharp, severe or intermittent, and may move or stay fixed. The other imbalance is caused primarily by a deficiency of the amount of energy that is moving through the body or due also to lack of nutrition provided by good circulation. This type of pain is usually dim, chronic constant is located in a fixed area. Very often the pain in humans is due to these two causes mentioned. Acupuncture treatment is usually used after an evaluation of the energy channels and the type of energy imbalance that is present. Acupuncture needles can be inserted into painful areas called 'Ashi points'. Then a series of acupuncture points should be selected to address the imbalance in the meridians affected, for example, if a middle-aged man who has chronic back pain caused by poor qi in the kidney and bladder meridians, some points are targeted in these meridians. Although what hurts is back, some points of the spleen and stomach are also used because they support the energy of the kidney and bladder. In addition there are two points on the back of the hands that are useful for back pain. After the points are selected, techniques needling differ according to whether energy is blocked or deficient. For example, if the energy is blocked, the needle is inserted against the direction of energy flow and turn against clockwise. In return, if the energy is deficient, the needle is inserted in the direction of energy flow and rotated in the same direction as clockwise. 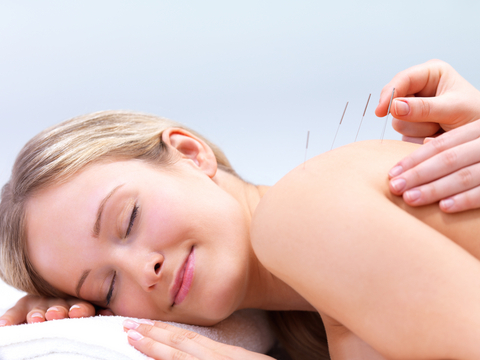 Traditionally, people receive acupuncture every day or on certain conditions. In the West people receive treatments once or twice a week due to financial and time constraints. It needs to have persistence in the course of treatment for better benefits. Acupuncture is used for its effectiveness in relieving many types of pain, There are promising findings in certain cases such as treatment of chronic back pain, and knee osteoarthritis. The problem with medical research is that it generally fails to make an accurate assessment of each patient's energy imbalance and also treats patients with persistent and often enough to show that its effectiveness is greater than placebo needle used in research. In animal studies, acupuncture seems to stimulate the production of endorphins and neurotransmitters regulating. Neurophysiological studies in humans indicate that acupuncture can reduce the electrical activity in the area of ​​the brain where pain is perceived. However, none of these findings may explain the dramatic and rapid reduction of pain. Acupuncture is generally considered safe when performed by an expert and when using sterilized needles, generally, there have been few reports of complications from the use of acupuncture. Serious side effects are rare, but include infections and organ perforations. Also, there are fewer adverse effects associated with acupuncture compared to the use of medications such as anti-inflammatory, or steroid injections, which are often used to treat painful conditions musculoskeletal system such as fibromyalgia, facial muscle pain, osteoarthritis, and tennis elbow.